Sergeant James T. Gaughan married Kathryn Feeney, daughter of Martin W. (Red) Feeney and Mary E. Lewis, before 1940. Sergeant James T. Gaughan died on 8 September 1951. Source: The Indianapolis Star, June 27 and Sept 9, 1951. The Indianapolis News, Sept. 10, 1951. 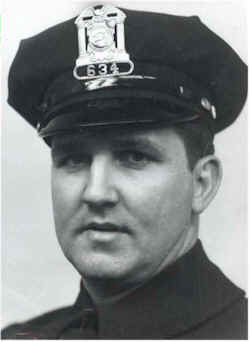 On September 8, 1951, Detective Sergeant James T. Gaughan, 37, was killed in an early morning collision between the police car in which he and his partner, Detective Sergeant Bethel E. Gaither, were riding and another car that was darting through the intersection at North and Alabama Streets. Both detectives were thrown to the pavement by the impact. Sergeant Gaughan, whose skull was fractured, died at the scene. Sergeant Gaither survived the crash. Sergeants Gaughan and Gaither were travelling north to investigate a disturbance in the 800 block of Alabama Street when a car darted east through the intersection. The driver of the other car was not hurt. He was held under $5,000 bond on charges of reckless homicide, vagrancy, and failure to stop at a preferential street. The accident brought strong criticism of the North and Alabama Streets intersection from police who reported "hardly a day goes by without an accident there." Sergeant Gaughan had been on the police force nine years at the time of his death. He was a Cathedral High School graduate and played football fullback. He was survived by his wife, Kathryn, an 11-year-old son, and 7-year old daughter. Sergeant Gaughan, a homicide investigator, was scheduled to leave on vacation after his shift on September 8. He and his family were planning a trip to New York City. He is buried at Holy Cross Cemetery. Earlier in the summer of 1951, Sergeants Gaughan and Gaither responded to the scene of the death of Officer Clarence Snorden. He was buried at Holy Cross Cemetery, Indianapolis, Marion County, Indiana. Marianne Gaughan was born circa 1944. She was the daughter of Sergeant James T. Gaughan and Kathryn Feeney. Marianne Gaughan died in 1948. Judge Jacob S. Miller married Kathryn Feeney, daughter of Martin W. (Red) Feeney and Mary E. Lewis, after 1951. Judge Jacob S. Miller died in 1994. Patrick J. Gaughan is the son of Sergeant James T. Gaughan and Kathryn Feeney. Kathy Gaughan is the daughter of Sergeant James T. Gaughan and Kathryn Feeney. Kathy Gaughan married Bill White after 1960. Bill White married Kathy Gaughan, daughter of Sergeant James T. Gaughan and Kathryn Feeney, after 1960. Marvin Elliott Bagwell was also known as Elliott Bagwell. He was born in 1900 in Georgia. He was the son of Clayton Alexander Bagwell and Eula Viola Ogletree. Emma Ophelia Mae Bagwell was also known as May Bagwell. She was born circa 1904 in Alabama. She was the daughter of Clayton Alexander Bagwell and Eula Viola Ogletree. Emma Ophelia Mae Bagwell died in 1921. Ruby Montene Bagwell is the daughter of Clayton Alexander Bagwell and Eula Viola Ogletree. Nina Clayton Bagwell was born on 7 February 1929 in Alabama. She was the daughter of Clayton Alexander Bagwell and Willie Dale Chapman. Nina Clayton Bagwell died in January 1996 in Houston, Texas, at age 66. Mary Jane Mathews was born on 14 July 1885 in Alabama. She married Pinkston V. ("Pink") Bagwell, son of Private Curtis G. H. Bagwell and Martha Ann Stevens, before 1909. Mary Jane Mathews died on 28 November 1956 in Birmingham, Jefferson County, Alabama, at age 71. She was buried at Midland City Cemetery, Midland City, Dale County, Alabama. Lela Lucille Bagwell was born on 8 February 1909 in Midland City, Dale County, Alabama. She was the daughter of Pinkston V. ("Pink") Bagwell and Mary Jane Mathews. Lela Lucille Bagwell died on 2 July 1975 in Midland City, Dale County, Alabama, at age 66. Mary Bagwell is the daughter of Pinkston V. ("Pink") Bagwell and Mary Jane Mathews. Ina D. Bagwell is the daughter of Clayton Alexander Bagwell and Willie Dale Chapman. Hazel Bernice Bagwell was born on 19 March 1921. She was the daughter of Clayton Alexander Bagwell and Eula Viola Ogletree. Hazel Bernice Bagwell married Jack Auston Glenn after 1940. Hazel Bernice Bagwell died on 25 January 1996 at age 74. She was buried at Trussville Cemetery, Trussville, Jefferson County, Alabama. Jack Auston Glenn was born on 17 February 1917. He married Hazel Bernice Bagwell, daughter of Clayton Alexander Bagwell and Eula Viola Ogletree, after 1940. Jack Auston Glenn died on 27 May 1990 at age 73. He was buried at Trussville Cemetery, Trussville, Jefferson County, Alabama. (?) Burke married Betty Jean Bagwell, daughter of Louis W. Bagwell and Gertrude Johns, after 1950. George Wiley Bagwell was born on 26 January 1866 in Tuscaloosa, Tuscaloosa County, Alabama. He was the son of James Wilson Bagwell and Ruth Caroline Kate Collins. George Wiley Bagwell married Ida M. Whitson in 1890. George Wiley Bagwell died on 16 August 1923 in Oakman, Walker County, Alabama, at age 57. He was buried at Day Cemetery, Oakman, Walker County, Alabama. Ida M. Whitson was born in September 1871 in Alabama. She married George Wiley Bagwell, son of James Wilson Bagwell and Ruth Caroline Kate Collins, in 1890. Ida M. Whitson died in 1923. She was buried at Day Cemetery, Oakman, Walker County, Alabama. Margaret Ann "Maggie' Bagwell was born in November 1872 in Dunns, Tuscaloosa County, Alabama. She was the daughter of James Wilson Bagwell and Ruth Caroline Kate Collins. As of 1894,her married name was Shepard. Margaret Ann "Maggie' Bagwell married Thomas Shepard in 1894. Margaret Ann "Maggie' Bagwell died on 14 January 1946 in Dorchester, South Carolina, at age 73. Emma E. Bagwell was born in June 1875 in Dunns, Tuscaloosa County, Alabama. She was the daughter of James Wilson Bagwell and Ruth Caroline Kate Collins. Emma E. Bagwell married Jesse "Miles' Baker on 24 December 1896.